Yesterday I returned home from a meeting with sixty-six other RSCJ, most of us from England, Ireland and Scotland. 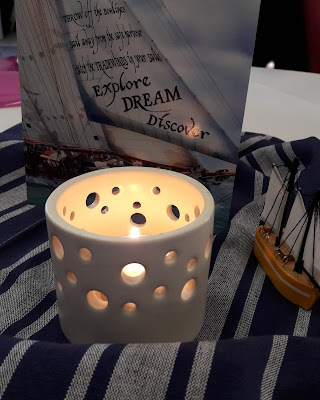 For a few days, in small groups and large assembly we prayed, reflected, shared, listened and explored together how we can live the calls from last summer's Chapter. Unavoidably, there were times of pain - both our own and that of the world. We began just after Theresa May's wearying, dispiriting announcement of her intention to call a snap election, and ended with the news of a fatal shooting in Paris. Refugees, the homeless and marginalised, trafficking, Brexit and so much more were ever present, in our prayer and in our discussions. But there was also laughter, the enjoyment of each other's company, the enlivening and energy of the large group, and the chance to catch up with friends, and get to know others better. Throughout the week we were nourished by each day's Gospel, in which the Risen Jesus talked, walked and ate with his disciples, challenging, encouraging and calling them beyond their fears, incredulity and limitations, gently yet compellingly showing them their new mission. And that is how it was for us, as we too were led, in the face of anxieties and uncertainties, to discern and explore what we can do more fruitfully together, to strengthen and extend the Society and its life and mission in our provinces. In our final reflection a sister in my small group spoke of experiencing the joy and the wounds of the assembly, and of each one. And it occurred to me that joy and wounds are at the heart of this Easter week - and at the heart of the Risen Jesus and our experience of him. We have the sublime joy flowing from Christ, permeating and transforming our own lives, enlivening us with the hope he offers to us and all the world. And we have the wounds, the indelible scars which, even in all his glory, Jesus chose to keep, and by which he was known and recognised by his disciples. Joy and wounds... at the heart of Jesus, at the heart of the Resurrection, at the heart of our world, and very rightly at the heart of us; women called - with all our wounds and fragilities, our prayer and passion, and our capacity for love and joy - to be the Heart of God on earth. How your words reverberate truth and wisdom. Thank you for creating such a wonderful site to visit and learn.